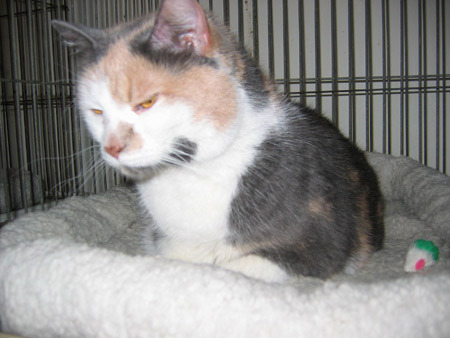 Check out Petfinder for recent adoptions from the MCSPCA. Each one of our adoptions is special, but we'd like to share some of our favorite stories. We adopted a little eight-week-old black kitten from you several years ago, and named her "Storm." She was shy and timid, and got a kitten cold within days of coming home with us. By then we were absolutely in love with her. It turns out that we were the perfect home for her and she was the perfect cat for us. Storm has weaved her way into our hearts and has become a central member of our family. She is well behaved, loving and loyal. She loves to play and eat, and overall she's pretty healthy (occasional colds when she gets stressed). During the Fall, she goes into her enclosed cat walk and hangs out on the deck with us while we grill. Storm's an indoor kitty who seems more dog than cat. She follows us around, sits in our laps, meets us at the door and sleeps with us. She loves us as much as we love her. 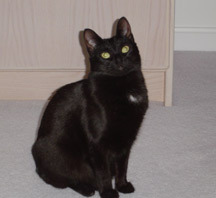 We are convinced that Storm is part Bombay cat -- she shares much of that breeds' temperament and she's got the face -- which by the way is adorable. One thing you might find interesting is that even though Storm is timid and a bit shy, she loves company. Even when we have parties, she's walking around in the room squeezing between the legs and watching the action. She is happy as long as no one tries to interact with her or pick her up. I thought you might like to see a recent photo of our little one. Hello, everyone. I just wanted to let you know how Banjo and Tinker are doing. They are the loves of our lives. They have finally stopped going into their hidey hole (a storage closet in the basement) and have been spending more time with us. They have added so much to our lives that I can't believe I waited so long to adopt. They seem very content and happy to be together although they have had a few small spats. But they both seem to hold their own. Again, I want to thank the adoption volunteers for all their help with the adoption. It was stress free, and I would recommend adoption to anyone who is looking for a pet. I would also recommend adopting an older cat since you really know what you are getting. They have already grown out of the kittenish escapades and can just settle down and be loved. Even though I'm computer literate, I still haven't become accomplished at putting pictures on the computer although I have taken quite a few. They are still in my digital camera. I just can't say enough about Banjo and Tinker other than they have found a forever home with us and seem happy to be there. They have become the loves of our lives and a joy to have. Thank all of you for your work in this very needy field. Hello Friends, This is MitzvahDogơmily. You may remember him as 姧yࠗe adopted this beautiful guy from you, officially, June 11th, 2005. Our most wonderful Shepherd mix (a little Yellow Lab in that mix, we think) is the most amazing LOVE to come into our lives. It has been a unique journey for all of us. When Mitzvah first arrived, it was pretty apparent we had adopted a beautiful diamond (somewhat in the ruff, but not really). He NEVER forgot his house training, or any of his training, for that matter. And he learned so many new things, incredibly quickly. Within 3 weeks of his adoption, he had totally settled into our routine and contributed some of his own. He began to understand that he was a shepherd and shepherds must be brushed on a daily basis 㯭ething we donനink had been done by his previous humans. He learned, very quickly, not to jump up on people, to walk slowly down the stairs and to stay in his unfenced yard, unless, of course, he needed to visit 铔 human neighbors on either side of our yard. He has become the joy of our neighbors and is consistently watching over all of them, and in turn, their relatives. He is just wonderful with 孡ns裂all ages and very nice at the vet௦fice, save cutting his toenails and examining his eye (not growling or bluster, mind you, just a lot of movement). Our neighbors to the north side of our house have 2 children that were previously afraid of dogs. Not so now. They just love Mitzvah and he loves them and all children! He plays a fierce game of fetch, often going 岴ical�y feet into the air. So we adopted a 宩or栯ne of our best decisions. Nothing beats his sweetness, love, intelligence, obedience and loyalty. He has grown with us, but we have learned countless lessons from him and because of him. He is the absolute 峴est䯧gie/human in the world!!! We THANK YOU for finding and fostering him. To this day we cannot understand why anyone, anywhere, could give him away. But we are, to this day, elated that he has been for the last 3 years, OURS!!!! And we are definitely, HIS! So You See, We Belong to MitzvahDog! 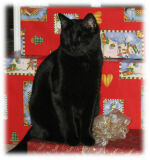 My family and I adopted a special needs kitten from the MCSPCA in April 2006. Cooper is special because he is blind. Cooper was born with eyes that were not fully formed and infected. 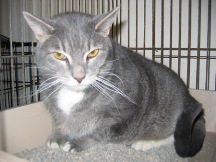 The MCSPCA had them removed on the advice of an ophthalmologist. 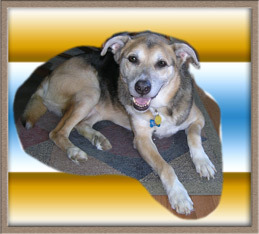 Cooper never knew he was blind and still doesn೵re you wonder what his handicaps are. He doesnਡve any. Cooper does everything a normal sighted cat does. Cooper learned the layout of our two-story home in less than two weeks. He rarely runs into walls or furniture. Cooper can watch birds from an open window by listening to the sounds they make. He plays with toys, chases and plays with his three beautiful sister kitties, jumps on the couch and bed, and uses the litter box normally. The only thing we found he canय is play with the laser toy, but he loves it when his sisters run around chasing the laser and joins in on the chase. Watch out if you are a fly entering our house. Cooper͊	record is about 10 seconds in capturing a fly. Cooper loves to play the Mousie Game which consists of one of us throwing his toy mouse up the stairs. He pounces on it and proudly returns it and looks up as if to say 貯w it again please.㯯per can be found drinking out of my glass and has never spilled any water. Cooper does all this without his SuperCooperman Cape. You should see what he can do when he෥aring his Cape! Cooper sees with his heart, we say. Cooper uses his other senses in place of his eyes to explore his world. He enjoys life so much and is such an inspiration. Just about every day he does something to amaze us. Thank you MCSPCA for our very special family member, Cooper.